This beautiful child is Rachel Arlene Steele. She lived in Richmond, Indiana until she became an angel on January 22, 2015. As stated in her obituary, “Rachel’s legacy will live on through her parents, Brian and Roxanne; sisters, Mariah and Sara; twin brother, Nathan. Rachel came into my life quite unexpectedly earlier this week when Bobby McQueen, one of our pharmacists at our company Jordan Drug showed me the following two photos. Bobby told me that his wife’s cousin had found a balloon in early February of this year in her yard near Booneville in Owsley County, KY. Since that day, Bobby had been trying to find Rachel’s family to let them know that someone had found her balloon that had been released five days after she had passed. Booby had e-mailed Roxanne but each time his message was returned as undeliverable. He thought he had found Rachel online by searching the website for Families For HoPE. He and I pulled up the site in my office and there was precious Rachel Steele. When we read she had a sister Mariah we knew we had the right family. I told Bobby I would find Rachel’s family and let them know that her balloon had traveled over 200 miles to land in Owsley County, KY.
That night I found the address and phone number for the Steele family. I phoned them immediately. I had to leave a message which I know was probably incomprehensible to anyone who heard it because of my excitement. You see, I have released many balloons over the years with messages of love and loss to my sons Drew and Jeremiah and no one had ever found one. No one called me back that night. First thing the next morning, I called the Steele home again. Same result, I had to leave a message. I’m certain I called their number at least four more times that day but always hung up before their answering machine came on. I felt that maybe I had been too forward so I decided to give Rachel’s family time to call me back if they chose to do so. Never one to give up, I sent them one of my bereavement packets and waited. Each day Luther would ask me if I had heard from the family of the girl with the balloon. Today I had almost given up hope of hearing from Rachel’s family. Then, while driving, my cell phone rang. Honestly, I never answer my phone while driving because I have so many bereaved families whose children have died as a result of cell phone use….but….the screen showed a number from Richmond, IN….Rachel!! A soft voice said she was Rachel’s mother Roxanne. She expressed her gratitude to Bobby McQueen for his persistence in trying to find their family. She was amazed that Rachel’s balloon traveled that far. She said they had each released balloon and had wondered if they would even get aloft since it was so cold the day of the release. Roxanne then related another one of God’s coincidences (His way of letting us know He is there). 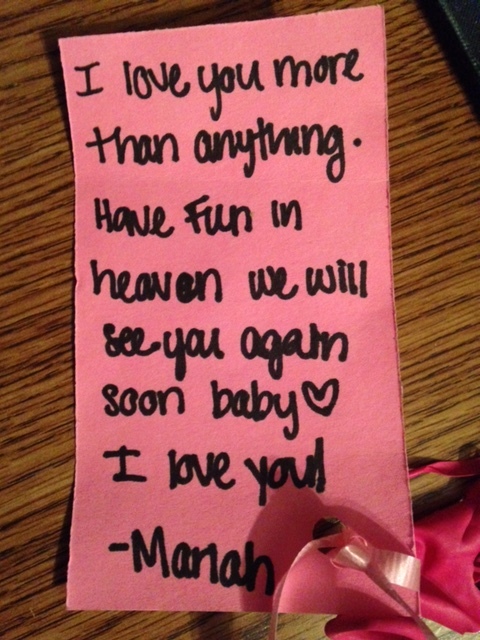 The only balloon found so far was of Rachel’s oldest sister Mariah. When she opened my packet, Roxanne couldn’t believe I was a pharmacist. Mariah is a pharmacy student and had just finished her finals when my packet arrived. It seems Rachel made sure her parents and siblings knew she had crossed over and was happy. 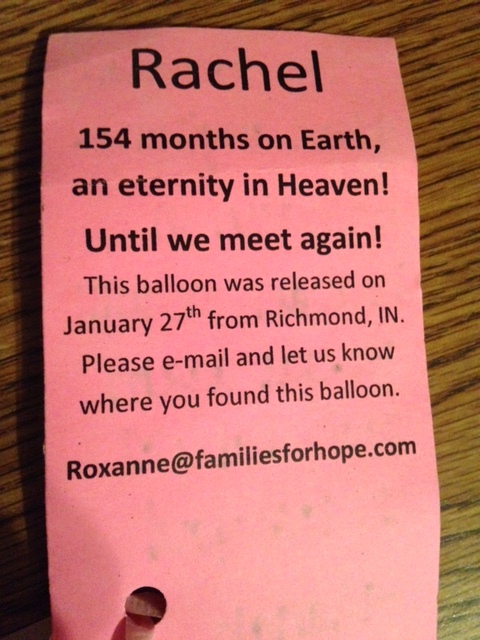 Her balloon soared from Indiana to Kentucky and has touched the lives of everyone who has heard this story, especially me.